Euclid Mayor Kristen Holzheimer Gail has suspended Police Officer Michael Amiott an additional 30 days without pay in relation to a controversial arrest back on Aug. 12. The mayor’s action brings Officer Michael Amiott’s total suspension time to 45 days following previous discipline from the police department. Officer Michael Amiott came under fire last month when a video of him arresting Richard Hubbard III went viral. 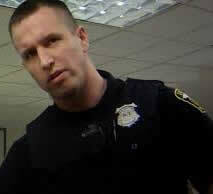 Officer Michael Amiott can be seen punching Hubbard multiple times in the video. Hubbard later pleaded not guilty to resisting arrest. In addition to his suspension, Officer Michael Amiott was also removed from the department SWAT team and ordered to undergo extensive training.